Sunday was the first full day our family had together in a pretty darned long time. It’s been a few of those months, you know? So we made a point to stay commitment-free (at least until my daughter’s 3:30 ballet recital) and work some needed errands into some down time. We got up early and headed to one of our favorite places for breakfast and a quiet morning walk around the water. The weather was beautiful, so we popped into a coffee shop to choose some morning treats before heading to a bench on the State House lawn to eat. I love this coffee shop, and I love the idea of supporting a local business over the nearby Bucks of Star whenever possible. But to be totally honest, their muffins have underwhelmed me. Dense and a bit on the salty side, they were more like misshapen scones, and I’m just not a scone kind of girl. So when DD picked out a chocolate chip coconut muffin, I didn’t have very high hopes that it would be eaten. It was devoured. She wolfed it down so fast that I risked a fingertip to tear myself off a bite, and got the most wonderful surprise I’ve had in awhile. Something about the coconut and the chocolate chips made for a divine combination that wasn’t terribly coconuty, but was moist and light and had just a tinge of crunch that made my mouth very happy (and put my cinnamon coffee cake to absolute shame). This is not a pina colada muffin. In fact, my guess is that if you just handed one to an unsuspecting person, he or she wouldn’t readily identify the coconut, but they’d love the muffin. Yesterday, I mucked around with my own chocolate chip muffin recipe and came up with a really good clone of that coffee shop pastry. Mine are miniature, which makes them great for lunchboxes and breakfast in the car (fewer crumbs), but you could certainly make them full-sized by increasing the baking time (and using full-sized chips, I’d think). If you want something more dessert-like, sprinkle sugar (sanding sugar would be fantastic if you have it) over the tops before you bake these up. One word of warning: Don’t substitute butter for the shortening in these. You’ll end up with greasy muffins, and those are icky. Pre-heat your oven to 375 degrees and grease a mini-muffin pan. Cream together the shortening and sugar in a mixer. Blend in egg, milk, and vanilla and mix well. Gradually, at low speed, mix in flour, baking powder, baking soda, and salt until just mixed together. Then stir in coconut and chocolate chips. 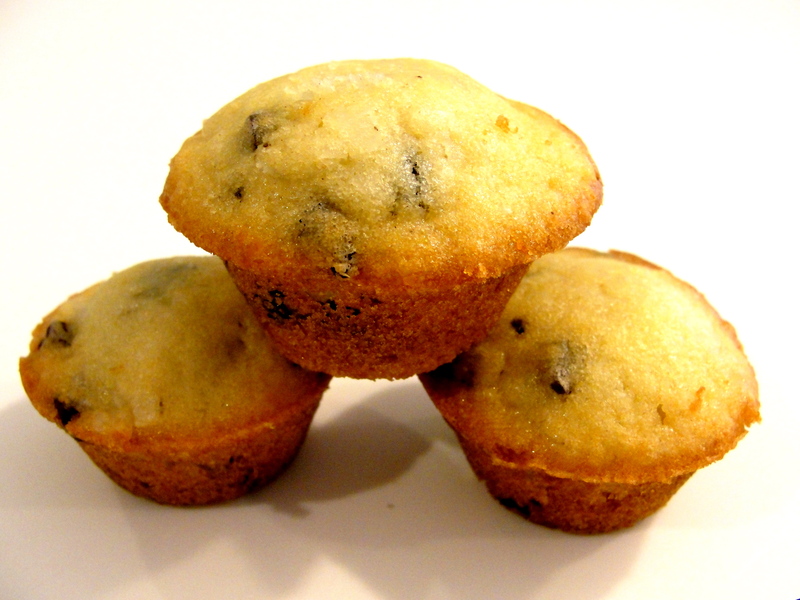 Spoon about a tablespoon of batter into each mini-muffin cup. Bake for about 12 minutes, or until the sides brown (the tops will not brown). Cool in pan about 5 minutes, and then remove the muffins from the tin to cool the rest of the way. I [heart} Annapolis and although I’ve only been in City Dock a couple of times, I agree that it’s a nice place. This is a nice time of year to head down to the hysterical district, too. USNA graduation is over and, if you get lucky, the weather is good. Now, if they would only do something with the Market House. Imagine my surprise when I clicked on your link and it came up Annapolis. HMMMM don’t you have friends who live there? I am going to give the muffine recipie a try this weekend. LOL! Didn’t think you’d appreciate the call at 7 a.m.!! I love love love coconut but I know what you mean. I think it just sort of enhances the chocolate flavor. It’s a great combo! I can’t believe I’ve never tried to make something like this. Thanks for the idea. First time here. Can’t wait to come back again and look around some more. Thanks for the inspiration.